yes that's right, my dreams came true! 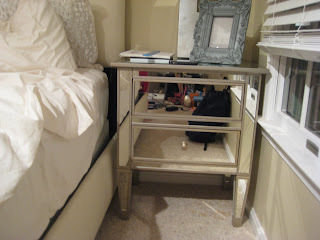 two mirrored night stands a la Pottery Barn for get this....$144!!! They were originally priced at $459 each, but my mom's business partner works at Pottery Barn Outlet, so she got a 40% discount off of the outlet price! It's just too good to be true :] Now I'm looking for the odds and ends, lamps, and some sort of credenza/sideboard/dresser thing. Hopefully I'll be able to find something soon. I finally got Hungry! Not litterally... THE BOOK, I started it and so far so good. Crystal Renn is a true role model and so inspiring. I also got The Secret to Teen Power. Some of you might have heard of The Secret before, it's all about positive thinking and getting what you want in life. Well they just came out with the Teen version, it's a very interesting concept and pretty powerful. Today's events were okay, I went to a picnic in the park for my friend's birthday. It was nice, but it just made me realize how much I'm not a people person. I love to hang out with my friends, don't get me wrong, but most of the time I'd rather be at home doing something passive by myself. That sounds a bit wallflowerish, but I'm such a introvert and always will be. I can be talkative and outgoing when I want to be, on occasion, however you will most likely find me enjoying somebody else's jokes and conversation. I'm definitely not an initiator. I used to hate this quality in myself, but now I am learning to embrace it. I think it makes me the person I am. The Secret is such a good book. I am definatly going to keep my eye out for the Teen version!! im very interested in reading it. Glad you're getting the stuff you want for your room. I'm a big fan of The Secret. It works. I love "The Secret" .. I've read it 3 times and plan on reading it again (once all this stupid school work is done, blech!) such a powerful concept! I'd love to hear how you like these new books ya got! Ah $144 for Pottery Barn? Dang you know how to shop girly. I hope you enjoy "Hungry", i've been wanting to read forever! Ooooh, I am currently decorating my new apt. Seeing such fabulous things on sale is so inspiring.